Hello, everyone! 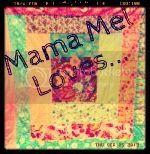 As you may remember at the beginning of this year, I mentioned that I had a new goal... to make a quilt a month in 2010. Well, here is quilt top #1. I should be finishing the actual quilting in the next couple of days. Just in time for my personal deadline. 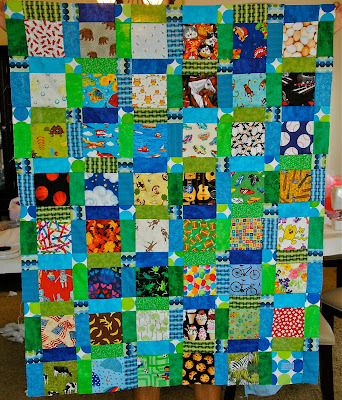 This quilt is an "I Spy" quilt for my son. It has 48 blocks, with 47 different "I Spy" squares. I collected a bunch of different fabrics for the "I Spy" squares, and will probably end up having enough to make another "I Spy" quilt! I tried to get a bunch of things that I know my son would be able to recognize and also things that he loves, such as cars, balls, animals, shapes, and of course, "Wubbzy"! ;) I used blues and greens in between the squares. I saved the last corner square for my tag. I will update with more pictures once I complete the quilt. Very cute! I've wanted to make an I Spy quilt for my son but never got around to it. Yours turned out so nice. You did a great job! The quilt is nice and bright. He'll have a fun time looking for all the different things in the blocks.